The Digital Production Buzz, the premier news podcast of NAB 2014 will feature over 80 influential interviews with a production, post production and filmmaking Who’s-Who! Also, comedic actor Corey Roberts joins Larry Jordan's coverage as roving reporter on the trade show floor! Our coverage," said Larry Jordan, host of the Digital Production Buzz, "provides a clear understanding of new products, product trends and industry leaders that our audience can rely on to make critical business decisions during the upcoming year. 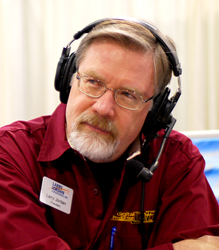 Larry Jordan & Associates, Inc. and the Digital Production BuZZ has finalized its industry all-star guest line up for its live audio news podcast of NAB 2014 in the Las Vegas Convention Center. From its booth #SL11505, the Digital Production BuZZ will be delivering live interviews with the production and post production industry’s most influential players. Additionally, the BuZZ will be delivering video broadcasts of its interviews as a result of its partnership with Moviola, announced earlier this month. The Digital Production BuZZ also announced that comedic actor, Corey Roberts, will join Larry as a roving reporter during the conference, adding some comic relief and an outsider’s perspective during the trade show. Corey has most recently appeared commercials for Cricket Mobile and Aamco, as well as the spoof web series, CSU: Crime Stoppers Unit. Look for him later this year in the comedy web series T-WATS Paranormal Investigators. During the course of the show, beginning Monday, April 7 through Thursday, April 10, the Digital Production BuZZ will feature over 80 of the industry’s most influential, innovative and insightful executives, filmmakers and thought leaders. A full schedule of interviewees will be available on the Digital Production BuZZ's special NAB Show site. Larry Jordan is the executive producer and host of the Digital Production BuZZ. Larry is a renowned media expert, Apple-certified trainer specializing in Final Cut Pro and Adobe Premiere training, author, and member of the Directors Guild of America and Producers Guild of America. Co-host Michael Horton is also an influential, experienced member of the creative community, and is well known as an actor, film editor and is the co-founder and co-producer of the world-renowned CPUG SuperMeet. Cirina Catania, supervising producer of the BuZZ, is a writer/director/journalist and member of the Producers Guild of America and the Writers Guild of America. To schedule an interview on the Digital Production BuZZ, contact Cirina at buzz(at)catania(dot)us. Debbie Price is the Special Events Producer of all the NAB 2014 coverage for the Digital Production BuZZ. She also produces the 2 Reel Guys video webisodes, all live seminars and events, and directs operations at Larry Jordan & Associates, Inc. To schedule an interview at NAB 2014, contact debbie(at)larryjordan(dot)biz.